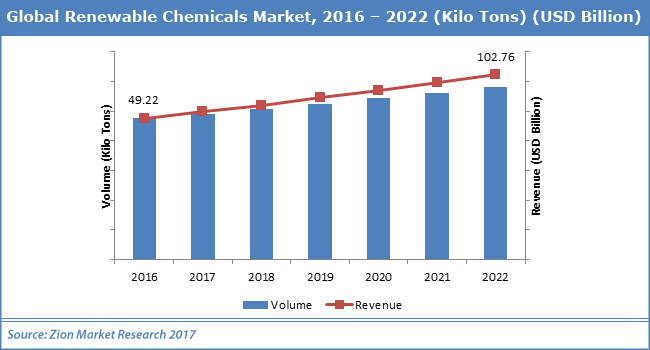 With the presence of a large pool of participants, the global renewable chemicals market is displaying a highly competitive business landscape, finds a new research report by Zion Market Research (ZMR). BASF SE, DuPont, Mitsubishi Chemical Corporation, and BioAmber are some of the key vendors of renewable chemicals across the world. These players across renewable chemicals market are focusing aggressively on innovation, as well as on including advanced technologies in their existing products. Over the coming years, they are also expected to take up partnerships and mergers and acquisitions as their key growth strategy across renewable chemicals market, states the renewable chemicals market study. Citing an instance, in August 2018, Ryze Renewables, a manufacturer of renewable fuels based in the U.S., entered into partnership with Phillips 66 Company, a U.S. based multinational energy firm, to construct two next-gen renewable diesel fuel units in Nevada. Sources cite that the two renewable diesel fuel manufacturing facilities are projected to produce 11,000 barrels quantity of renewable diesel fuel per day. Analysts forecast that the strategic initiative will encourage other industry participants to follow the suit and this is likely to promote the renewable chemicals market demand in the next few years. As estimated in this report, the global renewable chemicals market stood at US$ 49.22 billion in 2016. Witnessing a tremendous rise during the period from 2017 to 2022, the revenue in this market is expected to reach US$ 102.76 billion by the end of the forecast period. The main products available in renewable chemicals market are alcohols, ketones, biopolymers, platform chemicals, and organic acids. Among them, the demand for alcohol is relatively higher and the trend is anticipated to remain so over the next few years, notes the research report. “Massive depletion of sources of fossil fuels and growing environmental damage along with oscillations witnessed in crude oil costs will anchor the lucrative growth for renewable chemicals market over the coming years,” says the author of this study. Apart from this, favorable government policies and high product applications in various sectors such as food & beverages, farming, textiles, and biomedicine will foster the growth of renewable chemicals market in the ensuing years. Lower output and lack of technological innovations, however, can hinder the growth of renewable chemicals market over the years to come. Nevertheless, extensive R&D activities for achieving higher output along with devising of cost-effective methods of producing renewable energy chemicals is anticipated to accelerate the renewable chemicals market development in the years ahead, normalizing the impact of hindrances on the renewable chemicals market, reports the study. Regionally, Europe has been leading the worldwide renewable chemicals market and is anticipated to continue on the dominant position in the years to come, states the renewable chemicals market study. Escalated concerns about environmental pollution along with the sense of corporate responsibility prevailing among the manufacturers leading them to produce renewable chemicals based products is the main factor behind the dominance of the Europe renewable chemicals market. The high number of market players being headquartered in Europe is another significant factor that is supporting the growth of renewable chemicals market across the region.